This '91 action RPG from Virgin Games evokes mixed feelings amongst those who played it. It has every ingredient for a grand genre-expanding adventure, but may have fallen somewhat short in executing its ambitious vision. The story takes a few meanders outside the movie the game is based on, which should be a good thing if anything. This game is a crazy good action-rpg. 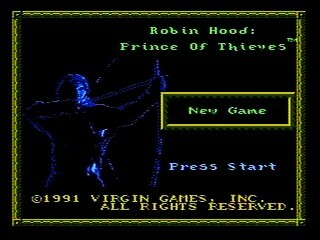 You play as Robin Hood, and put your band of thieves together throughout the game. The gameplay mostly takes place from an overhead perspective, but you also have a couple of big fights with tons of enemies on the screen, sidescrolling swordfights, and even chase sequences on horses! The game is very RNG-heavy, especially the guard spawns. Archers can quickly stunlock you and kill you with just a few shots, and there's no way to tell an archer from a regular guard. You can also get stuck on walls/trees/whatnot, so tight controls are very necessary. It's also very easy to softlock yourself inside objects if you're standing next to some when a fight scene triggers. I started running this on December 2013, my first runs we're on a PAL console, as soon as I switched to NTSC my times got a lot better, and I got my first Sub 30 live in a marathon, and it wasn't soon after that that I got this 29:28. It can probably still be improved quite a bit, but most of the improvable stuff are pretty much RNG-dependant. Arab Dungeons: Got stuck in a wall for a second. Boss fight went immaculately, there are a couple of frames in his animation during which you can roll behind him and stunlock him for the quick win. Sewers: It's usually best just to run past the guards until you get the Longbow. I got ganged up by two guards and ended up getting hit, but got away before they could do any real damage. Next guard after them is directly in my way so I had to kill him. If you perform a hit directly next to a guard, he dies with only one hit, normally it would take 2-3 hits to kill them. The big fight is usually pretty annoying, because the A.I isn't very helpful. It's much easier to control all the characters one at a time and move them to three different spawn points on the map. Hadrian's Wall: Here's where you pick up the Longbow, which is my main weapon for the majority of the game, as it kills pretty much everything with one hit. After picking up the bow there's a trick called Gisborne-skip, but how to do it constantly is still a mystery to me. The basic way to do it is drinking a speed potion and running through the fight trigger without the game noticing, usually works right after menuing, but it's very difficult to get. Missing it here will not amount to a huge timeloss, as you get a key from the fight to open up a chest which contains a speed potion, which you can use to catch up time lost in the big fight. After getting the bow you want to start killing as many guards as possible until you get your character up to level 2. Level ups in this game equal more health and agility, which in turn makes your character move faster. Locksley castle: If you're still under a speedpotion, it pays off to take the longer route to the castle (down and left, instead of just left) as you find a quiver of arrows and skip some dialogue. Only animals that you want to kill with the bow are wolves, because they give you 2xp, unlike the rats and bats which only give you 1xp. After Duncan joins your band, equip Locksley medallion (needed to enter Dubois Manor), drink the extra speedpotion and drop the unneccessary and heavy leather armor. I miss a couple of shots on the wolf after this, and lose about 2sec there. Dubois manor: The passage leading to the manor is a bit scary, because if you run directly into a guard here, you get challenged into a duel, which is a run killer. It almost happens with the last guard here but fortunately the scene didn't trigger. After you meet up with Marian and give her Peter's Ring, guards raid the manor, and here's where we run in to archers for the first time. They can easily stunlock you and kill you with only a few shots, so they are pretty much the biggest danger in the overhead scenes. Haunted forest: Getting the speedpotion before fighting Little John helps out a lot a little later on, so I take the 16sec to get it. Little John is probably the hardest fight, as his staff is a lot longer than your sword, and he can hit you a couple of times in succession. Trick here is to get him to jump on the rock and stunlock him to a crevice. Hard part is to keep him therea, as he can pretty easily get out of the stunlock if you mistime your hits. Baron's Marriage: The passage in to the castle is where you want to grind for the level up. Enemy spawns are pretty easy to manipulate here, and it doesn't take too long before I get level. After you get the level up, you want to refrain from using your arrows, unless an enemy is blocking your path directly. Second floor of the castle is usually Archer City, so you need to be careful, I get hit three times in succession, mostly because there is not enough time to shoot him between his shots. If you go into the Baron fight with full health, you can try to run up to him and stab him to death very fast. Here's where I display the roll-strat for the first time. If you trap the swordfighter in to the corner of the screen and roll in to them constantly, they jump upwards, which makes them very vulnerable for attack. It is by far the fastest strat for killing the last boss. After the fight I drop the saddle and use the bandages and the speed potion to make more room into my inventory. Giant Boar: The small boars take a couple of hits to kill so it's better to avoid them. For the Giant Boar you want to equip Little John's staff, which you can use to stunlock the boss very easily for the quick kill. Being LVL2 helps out a lot here, because you deal 5dmg per hit instead the of 4dmg on LVL1. I don't run close enough to the Boar at the start so I have to wait a little before he charges me. After that you just sit and wait till it runs out of HP. Haunted Well: Before heading out to this mission I pick up a couple of potions from the camp. Pick up all the quivers that are near your path, because you need a lot of arrows for the last big fights in the game. You want to avoid the corpse next to the well because it triggers a few lines of unnecessary dialogue. Dropping down in to the well you want to use a speedpotion, and after that runs out you want to top it off with another, as there's not too many obstacles in your way here. Coming out of the well you still want to steer clear of the body, and make your way back to the camp running next to the river. This is one of the easist places to get stuck in walls, especially with the speedpotion, but I managed to get past it with only 2 hits. Meet Marian at the Chapel: Best enemies to spawn here are wolves, because rats and bats can easily slow you down, and soldiers can be archers, in which case you're in for a lot of damage. Marian gives you the Druid's Dagger, which is needed to kill the penultimate boss in the game. Tax Carts: This is where you finally kill Guy of Gisborne. The rock fights are simple enough, you need to get your enemy to the right side of the screen, and get him to jump up on the rock and stab him to death. It takes a little while to get him to the right side, there's a big possibility for improvement here, if the fight went perfectly. After the fight Friar Tuck joins to your group. Back at the campsite, you want to avoid talking to Marian because it takes a lot of time and you lose Duncan in the process. Weapons Master: The road to the Weapons Master is riddled with archers, so I take a couple of precise shots to take care of a few bad ones. The Weapons Master fight is pretty much the same as Gisborne, but he has a lot more height to his jump, which can make things a little difficult. After the fight I pick up a couple of items from his hut but I miss the last one for a quick second there. Mystical Pond: This is one of the hardest overhead scenes, as you face three lake monsters who shoot arrows at a very fast rate. Luckily they can also shoot eachother out, so positioning is very important here. After the fight I quickly fill up a couple of flasks with the Healing water, which restores your health and gives you a speedboost. The Village: Here's where you pick up the best weapon in the game, the Crossbow. It fires way waster than the Longbow, and allows you to wield a sword at the same time. Going in to the Village fight scene you want to steer clear of the trees and the buildings, the game is notorious for locking you inside them if you stand too close to them when the fight scene triggers. After this fight it's another rock fight with the Baron. I come very close to death here because I get stunlocked between a rock and the Baron's sword, but luckily he stops his attack just in time. After this he trolls me for a while, because I can't risk going near him, as I'm only one hit away from dying. Luckily I get to jump over him and finish him off. Going back to the campsite I almost get killed by an archer, but get very lucky. Campsite fight: Sometimes if you press two buttons simultaneously, this scene glitches and you can't see any enemies, even though they are around. If this happens, you pretty much have to do the fight blindfolded and hope for the best. After the fight I enter the hut to my right to pick up a few potions and the Disguise needed to enter Nottingham Castle. Outside the hut you need to steer clear of the sleeping guy, if you touch him it's a few lines of unnecessary dialogue. I forget to equip the sword in the menu here, but I do it a little later on. Nottingham castle: Just before the big fights I give one of my guys a health potion for him not to die 5sec in to the fight, but archers always prove to be a big problem in these fights. Now that there's only two big fights left you want to start shooting as many enemies with the crossbow as you can. Last big fight is basically just shooting arrows like Legolas, but for some reason my shooting button stopped working for a second, halfway into the fight. After the fight I equip the Druid's Dagger to take care of the Giant Skeleton, and from there it's on to the last boss. This fight is very tricky because the Sheriff deals a huge amount of damage with his sword, and is fast enough to hit you a couple of times in succession. The roll-strat described earlier on works very well here, and I take care of him in a record time.